I'm trying to export a PDF of a map of northern Europe. The resulting PDF file is missing the British Isles and smaller islands. This does not occur if I use a lesser detail shp (https://www.naturalearthdata.com/downloads/50m-physical-vectors/). I have also tried reducing the DPI settings (although that shouldn't matter for a vector) to no avail. I'm using QGIS version 3.4.5-Madeira 64-bit on a Win10 64-bit machine. The problem also occurred when using QGIS 3.6. Mapperz seems to be correct. I cropped the original high detail shapefile (method: Cropping Shapefiles in QGIS?) and repeated the procedure described in my question. Everything looks as it should. Cheers! There's a lot of useful information in the comments, which I summarize here so it doesn't get buried. Credit to @Mapperz and @Juan. QGIS doesn't crop the data to the map extent when exporting to pdf, so the vertices outside the map extent still count towards the total number of vertices. I made a feature request. The current solution is to reduce the number of vertices before exporting. Starting with the layer with the most vertices, apply these methods until the output falls below the 32,768 vertex limit. Crop the data to the map extent, as explained in @Juan's answer. This method will not alter the data within the map extent. Use the Simplify algorithm to reduce the vertex density. This method will alter the data within the map extent. Simplify This algorithm simplifies the geometries in a line or polygon layer. It creates a new layer with the same features as the ones in the input layer, but with geometries containing a lower number of vertices. 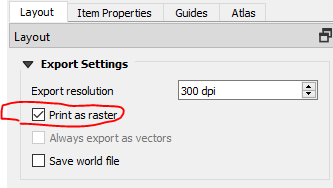 A workaround would be to export as raster instead of vector. Rasters don't have vertices, so the 32,768 vertex limit doesn't apply. Is there a way to get the vertex count? Is 32,768 vertices an absolute limit or is there a way to increase it? Does filtering the layer reduce the number of vertices in the output? This would be a more convenient solution than cropping or simplifying. Not the answer you're looking for? Browse other questions tagged qgis export print-composer pdf or ask your own question. Why is the vector style in the PDF export different than in print composer?